✓ Social Attraction - Measures the degree of attraction to people and the degree of confidence of the puppy. ✓ Following - Measures the puppy's degree of attraction to people. ✓ Retrieving - There is a high correlation between the ability to retrieve and success at being a performance dog. and shyness. A puppy with a high degree of sensitivity to sound needs additional desensitization through a puppy class for example. ✓ Chase Instinct - The chase response (also called "Prey Drive") to a moving object. Play drive is measured here as well. ✓ Stability - To evaluate the coping ability when being startled. ✓ Energy Level - To evaluate the degree of physical energy of the puppy. 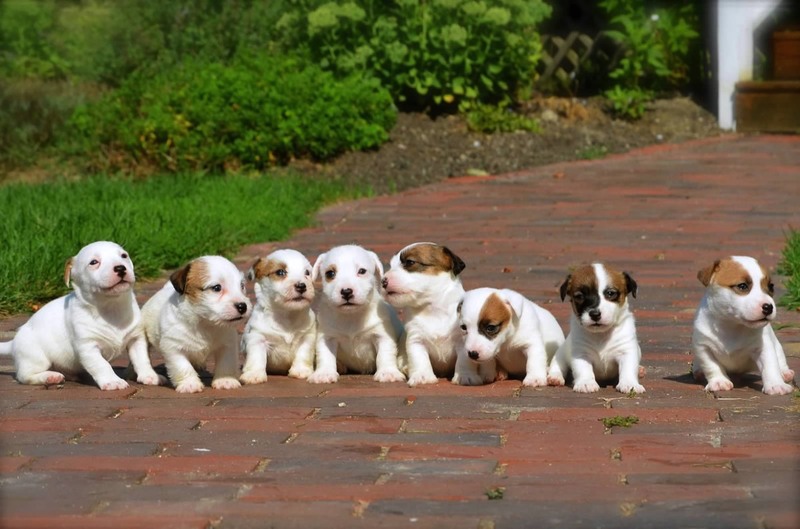 FAMILIES THAT HAVE PICKED A PUPPY FROM US BASED ON TEMPERAMENT, HAVE DECLARED THEY WILL NEVER PICK A JACK RUSSELL TERRIER PUPPUPPY ANY OTHER WAY AGAIN. WE WILL CHEERFULLY SUPPLY YOU WITH REFERENCES. After years of education and experience with puppies and placing puppies in homes, we were looking for a better way to categorize pups, making it easier for a family to select based upon their lifestyle and needs. In the beginning, we used the Volhard Method to test pups. The results were often difficult for people to understand and the scoring could lead to some confusion. After some time, I began to believe the method was flawed. I often found myself abandoning the test scores and simply talking with families about the pups personality, intelligence, tolerance and energy level. For this reason, we have created our own way to share details and accurately describe each puppy to potential families. As of April, 2015, I am unaware of any science-based study with statistics and hard data that proves one can predict exactly what a puppy will be like as an adult. A puppies brain is fully developed around the 49th day of life - give or take a few days. We continually observe the puppies and make recommendation based upon the pups personality at that time. As with any living thing, you must nurture it along. With proper handling, the puppy will thrive and become a valued member of your family. But you can’t expect the puppy will develop into the dog you want all on his/her own. You must take an active roll - especially over the next eight (8) critical weeks in your puppies life. So to be very clear, please understand this about temperament testing: Scores are indicative not predictive of adult behavior patterns. Our Polished Puppy Assessment and Evaluation program is practiced to provide an accurate and objective evaluation of the behavioral tendencies of a puppy. Similar programs are used by those that train police K-9's, Search & Rescue, dogs for the blind, and so on to pinpoint tendencies in very young puppies before they are influenced by the environment. Behaviorists, trainers and serious breeders will recommend objective testing as a helpful tool when placing puppies. Even if a pup is not destined to be a working dog, it is still important to know the puppy's base temperament as well as possible to match both puppy and owner. 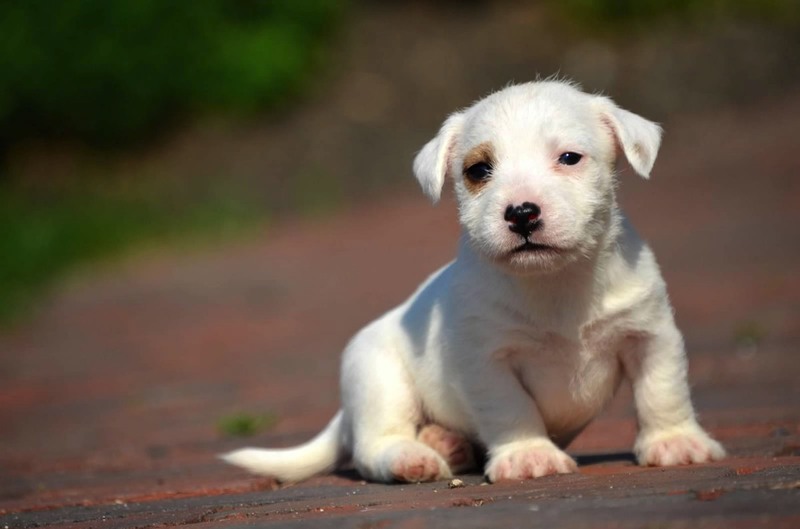 All owners want the perfect Jack Russell but the perfect pup for one person could cause chaos in another's household. Confident, energetic puppies readily accept human guidance when you practice positive, force-free training and remain consistent. This dog responds best to an owner who is determined and decisive. This dog is friendly with a good amount of energy. He will be well adjusted if he receives regular training and exercise. Outgoing dogs usually have flexible temperaments that will adapt well to different types of environments provided they are handled correctly. They are most excellent family pets in the right type of household. In the wrong home, they may get into too much mischief. Start off right with this puppy and learn to treat when you train. Middle-of-the-road pups are fairly easy to handle and cooperative but they still need consistency and training. He will often look to his people for guidance. This pup can be easy to train, reliable with children, and though at times he may lack a little self confidence, he makes a high quality family pet and responds very well to positive, force-free training. Make no mistake though, this pup can and will develop frustrating or undesired habits if you do not commit yourself to training him right. This dog has a little less energy than a busy pup and his demeanor is friendly and gentle. This pup will still need regular exercise. An all around great dog for most situations. The mellow, shy or slightly insecure dog may have a lower energy level, be submissive or lack confidence. If we have a pup in this category, we will give you more specific details about the pup as each one is a bit different. He usually bonds closely with his owner and requires regular guidance and encouragement to bring him out of his shell. If handled incorrectly the insecure dog can grow up shy and fearful. This pup does best in a predictable structured lifestyle with owners who practice positive, force-free training with patience and are not overly demanding. Not a great choice for engaging, loud or busy children. The Extrovert Puppy is motivated by a variety of stimuli including human contact, other dogs, food and has play and/or ball drive. They take great pleasure in activities that involve people, other dogs, toys and of course, treats. ￼An extroverted dog will be happy to play on their own with toys or ball, invent games and generally speaking, are easy to motivate. They will work for toys (fetch and tug games) and often do not need any extra coaxing. They find it less rewarding to spend a lot of time alone and can be more prone to boredom. When bored, these pups will usually invent a game all by themselves. Gregarious, approachable and usually unreserved. An extrovert puppy likes to be where the action is and can be the "life of the party”. If given the choice to spend time with their humans, or play with other dogs or just play with toys, this pup will be open to all possibilities. ◆ ◆◆◆ E-1 = Confident & Energetic -- Puppy oozes with excitement about life in general! Life is so full of things to play with like balls, toys, rocks, socks, pant legs, fingers and toes. This pup loves meeting new people and thinks life is all about having fun. This puppy will have a lot of energy and is certainly not for a couch potato. Play, play, play - fetch and tug are great - the more the better. Provide them with stuffed kongs, treat balls, puzzle toys and so on to keep their minds engaged. With or without you, they are going to have a good time! This pup will require a variety of fun toys and puzzles to keep the mind engaged. Exercise is important for both mind and body. ◆ ◆◆◆ E-2 = Middle-of-the-road -- This pup is the total package. Teach her, praise her and she’ll guarantee to make you proud no matter where you take her. This dog is naturally curious, trusting and playful in nature. Toys, balls, fetch and tug games will be appreciated. This little pup will need stuffed kongs, treat balls and puzzle toys or a daily walk or play session and will also be equally satisfied to curl up in your lap. Much like the E-1 but with a bit less energy overall. ◆ ◆◆◆ E-3 = Mellow, shy or slightly insecure -- This pup is also the total package, but with a bit less energy and confidence. Smart, willing to learn and eager to please. With a little patience, you can certainly teach this pup anything. Very loyal, steady and playful but in some cases, may not be quite as confident and daring as other pups. This little pup will still need stuffed kongs, treat balls and puzzle toys or a daily walk or play session and will also be equally satisfied to curl up in your lap. 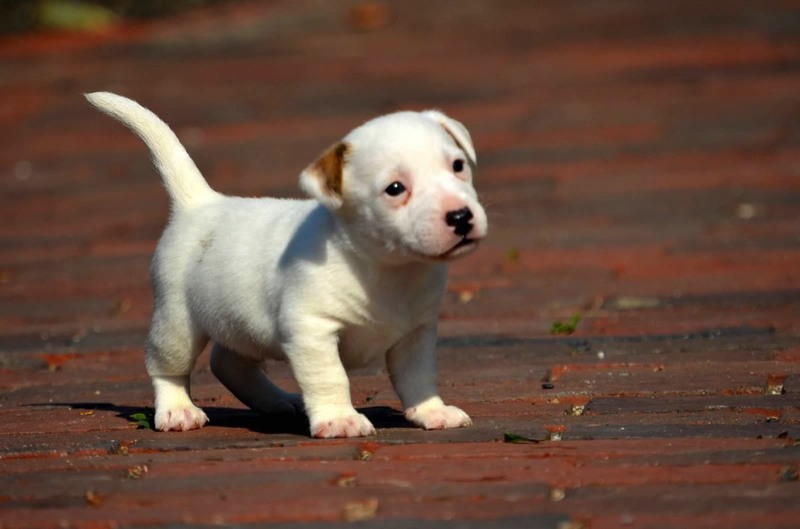 The Social Puppy is motivated mostly by attention and interaction with people. This puppy values human attention above anything else. They will have some interest in toys but can loose interest over time. Toys, balls, fetch and tug games are fun but only to a point. This pup is more interested in you than in toys or playing without you. This puppy is a companionable little buddy, and will be your shadow for certain. The social puppy enjoys being the center of attention, shines in social settings and makes new friends everywhere they go. This pup will not do as well being home alone every day for long hours. Not for someone who works full-time outside the home and has not arranged for doggy daycare during the week, a dog walker each day or other arrangements if you are gone from the home 5+ hours each day. ◆ ◆◆◆ S-1 = Confident & Energetic -- This is a high energy, all-purpose pup ready to commit to his new family. He will find every family activity fun, interesting and enjoyable. Social pups will play with toys, balls and enjoy fetch or tug games but they will get bored with them after a bit. He will always prefer human companionship over all else. This dog is ready, able and willing to be your constant sidekick. He will need daily play sessions, walks or rides and interaction with his human family members. Loyal to the end. Life will never be boring with this little terrier. This is a great dog to take to work with you! This dog will not do well being home alone on a regular basis for extended periods of time. ◆ ◆◆◆ S-2 = Middle-of-the-road -- Fun-loving and always ready for a good time. His playfulness and general silliness will keep you and your friends entertained and laughing. He is a little less outgoing than the S-1 above, but still quite entertaining. Social pups will play with toys, balls and enjoy fetch or tug games but they will get bored with them after a bit. When he becomes a bit too overwhelming, a redirection settles this pup down quickly. Another great choice if you want to take your pup to work. This dog will also not do well being home alone on a regular basis for extended periods of time. ◆ ◆◆◆ S-3 = Mellow, shy or slightly insecure -- This pup is ready, able and willing but might be a bit quiet and shy at first. He will thrive in a home where his humans are patient, able to gain his trust and teach him new things. It may take him a little more time to become comfortable with people he has never met before but will warm up. This pup is pretty low key and will be just as happy sitting near you as taking a leisurely stroll around the block. This type of puppy can easily end up being a very devoted friend. This puppy will not enjoy spending most of his life home without you. The Introvert Puppy is motivated by stimuli that is not as easy to see, predict or control. ￼This puppy is often independent. Not a real driven dog - it will be much harder to create an interest in toys…you will have more success building their food motivation. This pup will be fine with solitary time and activities. Do you work from home and need several hours a day of quiet, uninterrupted time? Or are you gone several hours during the day? This may be the right pup for you. They will still need walks and exercise as they do come with different energy levels. An introvert puppy is usually quiet around strangers, doesn’t draw attention to themselves and enjoys time alone. He will mature into a dog who is usually not demonstrably affectionate. These dogs are less likely to be despondent if left home alone. 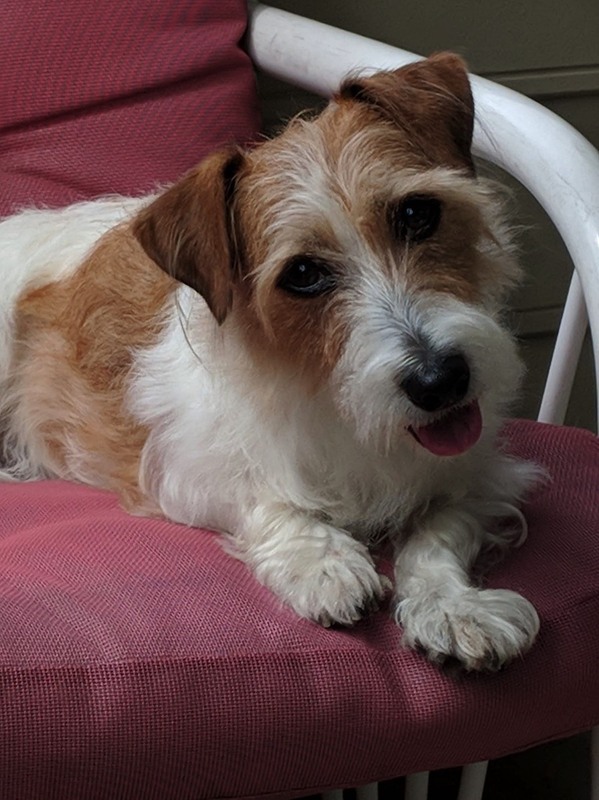 *We see very few true introverts within our litters as "aloof" is not what we are breeding for and is truly not the inherent nature of any Terrier. ◆ ◆◆◆ I-1 = Confident & Energetic -- This pup will have a little bit of ambition. He is intelligent, independent, clever and confident. They like to set their own rules but can be persuaded…especially if a high value food or treat is involved. Don't expect this pup to be too toy or play motivated. This puppy will enjoy hard working, confident, somewhat busy humans. Sometimes he will prefer to do his own thing... and perhaps to your frustration. This terrier will view you more as an equal, and be an independent thinker more than just blindly follow his humans. ◆ ◆◆◆ I-2 = Middle-of-the-road -- Easy-going, relaxed pup who will prefer a slightly laid-back human and a lower stress relationship. It will help if you are positive, patient and enjoy leisurely walks followed by a quick, yummy snack and two-hour nap, and simply be willing to explore the joys of simply relaxing together. If you like “the easy life” at home or work outside the home often, this pup may be a perfect match for you. Naps in the middle of the day and curling up in the same room with you is a fine way to spend their day. ◆ ◆◆◆ I-3 = Mellow, shy or slightly insecure -- This pup may view the world as a big and scary place especially if they are not socialized and taught basic core training. With the right training, this pup can easily learn his way around. This pup may appear a little shy but really just needs someone to help them come out of their shell. Charming and sweet they blossom with patience and understanding. Until they are familiar with a new place, they may be more comfortable close to you... or maybe just a little behind you. Not a good choice for children as the pup will be less engaging. 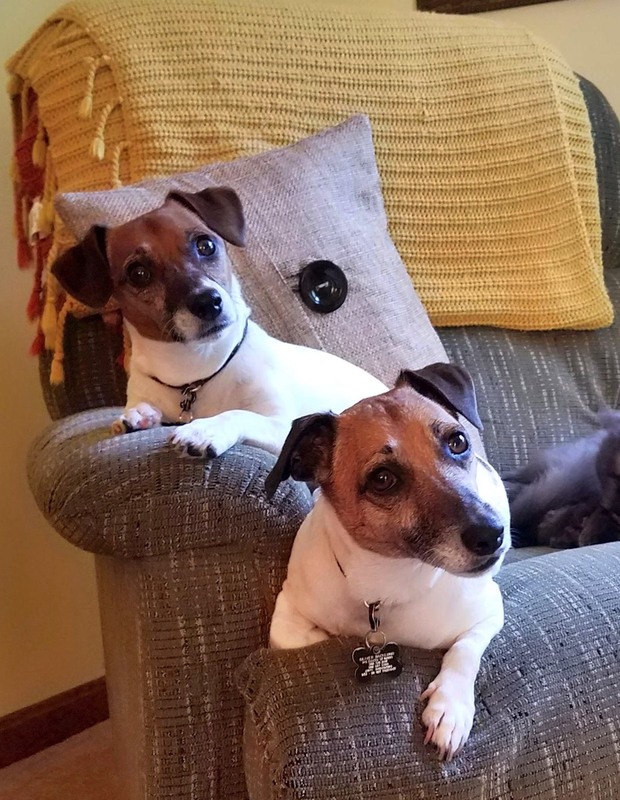 "Oliver" and "Violet" got a new little Jack Russell brother last year and moved him into their home in Massachusetts. He is from Kylemore Terrier. 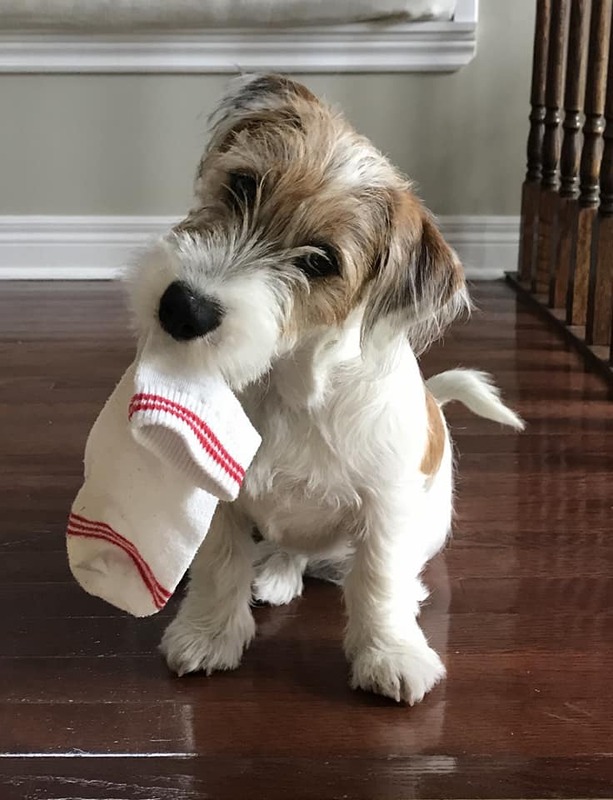 "Cricket" in Canada is one fun loving jack russell terrier. She likes to go bike riding too! "Eimear" a Connemara Terrier who retired to Lexington, Kentucky. Eimear is our Bitsy's Mother.